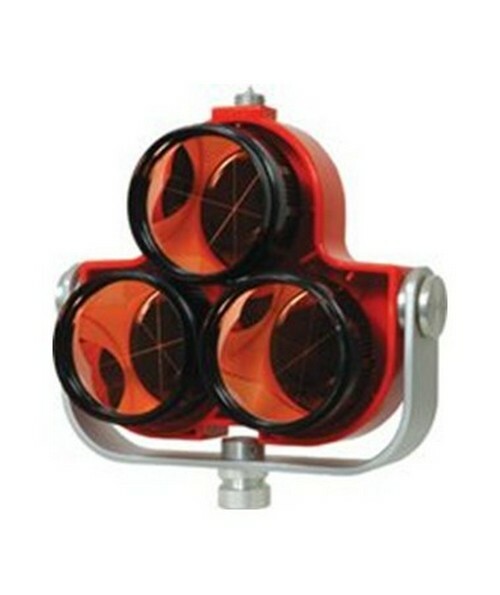 The Seco Tilting Triple Prism Assembly 6341-00 features three copper-coated prisms with 62 millimeter diameters and 0/-30 millimeter offsets inside black, plastic canisters. Each prism canister has a M20 thread that attaches easily to this prism assembly's orange triple prism mount. The triple prism mount holds one to three prisms and is made of polycarbonate which is both UV and water-resistant. An aluminum holder holds the prisms and mount and has a 5/8 x 11-inch thread that allows surveying professionals to mount the entire triple prism assembly onto a prism pole. A sighting collimator gives you maximum visibility for pointing or tilting your triple prism assembly for long distances.